Midland is one of the most successful companies that produce electronic devices. There are various incredible Midland devices available on the market. People all over the world use and trust this brand. The walkie-talkies from Midland have various remarkable features which makes them perfect for taking them on long trips. You can use these devices for all kinds of purposes and you will not be disappointed in their quality. Midland walkie-talkies will last you for years because of their tough body and rechargeable batteries. With multiple power options, and incredible specs, the Midland walkie-talkies will be perfect for you and you will not regret investing in them. Midland produces a lot of high quality walkie-talkies. If you are interested in a Midland walkie-talkie then read on as we review five of the best Midland radios. If you are looking for one of the best walkie-talkies around, then do check out the Midland GXT1050VP4. Considered among the top contenders in the list, this walkie-talkie has an ability to filter signals allowing you to have crisp and clear communication. You can make radio calls directly to users who have similar devices without alerting anyone else on the channel. With the NOAA alert system and SOS distress siren, this walkie-talkie can actually save your life in times of crisis. The device comes with rechargeable batteries so you can go on long trips without worrying about the battery dying out. The tough exterior makes this walkie-talkie water-resistant and perfect for those trips to mountainous areas. Admittedly, this walkie-talkie is a bit complex to use for beginners, but once you have gotten the hang of it you will never go on a trip without this trusted companion. Among some of the best long range walkie-talkies is the Midland GXT1000VP4. This walkie-talkie is one of the more popular walkie-talkies currently available. The GXT1000VP4 has a high power output, which results in an effective range of up to 2 miles under many different circumstances. You can not only use it communicate with your friends on a hiking trip, but this device can also be used in the areas where your phone doesn’t work. Some of the features of the Midland GXT1000VP4 are: great clarity, weather channels and alerts, hands-free mode, silent mode, group mode and lots more. The Midland GXT1000VP4 is among the best walkie-talkies available today, buy this amazing model now and you would not regret investing in it. If you are looking for a good walkie-talkie from Midland then you should definitely check out the Midland LXT600VP3. This walkie-talkie has a range of up to 30 miles and allows you to access 36 channels. It also comes with 121 privacy codes and gives you abundant channel options so you can block other conversations. The Midland LXT600VP3 comes with three AAA batteries and you can also use a rechargeable battery pack to keep your walkie-talkie functioning for a long period of time. With the Midland LXT600VP3 by your side you will never miss an alert as this walkie-talkie is able to lock on to your local weather channel and inform you of severe weather conditions. The Midland LXT600VP3 is an incredible device and you will not regret buying it. Another contender in the list of top models from Midland is the Midland LXT500VP3. This device has an excellent user rating and is being used widely for all sorts of purposes. The walkie-talkie is able to access up to 22 channels and has a range of 24 miles. With this device you can enjoy crystal clear sound and easy communication no matter where you are. The Midland LXT500VP3 comes with rechargeable batteries which allow you to use the device for long periods of time without having to worry about running out of power. Some of the other excellent features of the Midland LXT500VP3 are call alert, silent operation, keypad lock and dual power options. The Midland LXT500VP3 is among the most durable walkie-talkie sets with a wide range and you should definitely check it out. Finishing up our list of the best Midland walkie-talkies is the Midland LXT118VP. This device has everything you need in a reliable walkie-talkie to take with you on an exciting tour. The walkie-talkie is able to access 22 channels and has an advertised range of 18 miles. The Midland LXT118VP also features an ability to perform a channel scan to look for channels with activity. With its tough exterior and water resistant body, the Midland LXT118VP is perfect for taking on those trips where taking your cellphone can be risky. This walkie-talkie from Midland is designed to extend the battery life and also features dual power options. All in all, the Midland LXT118VP is an amazing device and is worth investing in. 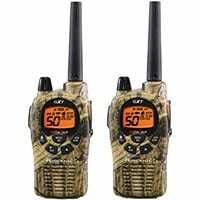 If you are thinking about buying a walkie-talkie from Midland then there are certain accessories that you can buy along with your set. In this section we discuss the three most popular accessories. One thing that can really help you during your travels is a good headset. If you own a Midland walkie-talkie then you should get a headset compatible with it, so you can enjoy hands-free communication wherever you are. We recommend these Aike clip-ear headsets for Midland walkie-talkies. If you want to stay connected with the world at all times then get a good charger to recharge your batteries. There are some great chargers available which are compatible with Midland devices, we recommend this Home Wall charger for the Midland GXT1000 series. You should definitely consider getting a pack of backup batteries, so you will always be able to use your device. If you are looking for a pack of batteries at a reasonable price that are compatible with your Midland device then you should check out these Midland rechargeable batteries. There are so many great walkie-talkies from Midland available, and choosing the right one can be difficult. But if you do a little research you can definitely find the best set for your needs. You can't really go wrong with any of the models recommended in this guide.